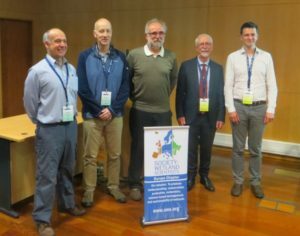 The renewal of the Memorandum of Cooperation between the Society of Wetland Scientists (SWS) and the Ramsar Convention was signed during the SWS Europe Chapter meeting being held from 2 to 6 May in Faro, Portugal. The Memorandum was officially signed by the Secretary General of the Ramsar Convention, Martha Rojas-Urrego and the President of Society of Wetlands Scientists, Gillian Davies. SWS are represented on the Ramsar Scientific and Technical Review Panel (STRP). Rob McInnes of RW Wetlands & Environment served as SWS’s representative to STRP between 2011 and 2015. The two organisation also share educational initiatives such as collaborations on webinars, curriculum development, symposia at SWS Annual Meetings, World Wetlands Day, publication of Ramsar articles in SWS publications, potential Ramsar involvement in the new SWS international exchange program (Wetland Ambassadors), and SWS assistance with Ramsar outreach to citizen scientists, to name just a few. More information can be found here. The SWS Europe meeting in Faro was attended by over 80 wetland scientists from around the world. The meeting, Sustainable Management of Wetlands, explored novel approaches for water management, biodiversity conservation, wetland restoration, pollution control and climate change. Sessions included themes on the ecological quality and conservation of wetlands, wetlands and water quality and opportunities for paludiculture. The meeting was also the first time that all the past-presidents of the European Chapter of SWS had been present (see photo) at the same time. Past Presidents of SWS Europe, from left to right, Professor Chris Freeman, Rob McInnes, Dr Jan Vymazal, Dr Jos Verhoeven, Dr Matthew Simpson (Current President).